Today ‘Eliza Doolittle’, Shaw’s flower girl, would never be able to elevate her social status, by changing her accent and wardrobe. Hinton remains true to the essence and form of the play while creatively capturing the frustrations of modern times. The sense of social alienation is effectively enhanced by EO Sharp’s design of Higgin’s apartment. Large mirrors reinforce the professor’s narcissism–walls full of ancient books his sense of intellectual superiority, and large TV screens fill the room emphasizing his emotional detachment. Eliza’s frustrated face is viewed onscreen while her speech is scientifically evaluated. McManus and Jeff Meadows; as Higgin’s sidekick the stuffy but heartwarming researcher Colonel Pickering, dissect the form & pattern of Eliza’s personal interactions but without addressing the message & the meaning behind what’s being said. In Higgins’ mother’s suite, the backdrop is a flowing river where patio doors open out onto a balcony allowing the fresh air & flexibility of open-mindedness to enter in. Mrs. Higgins, played by Donna Belleville, seemed to be the only character unaffected by the class debacle –projecting a secure, regal and demure demeanor. She was delightful as Higgin’s mother—warming up the stage each time she entered. 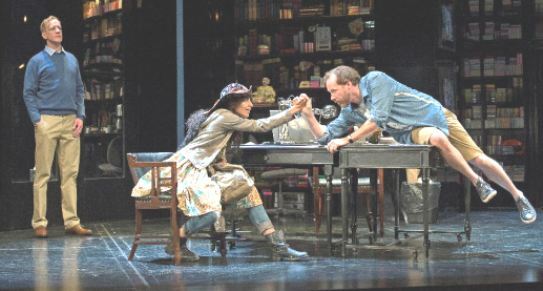 The play reinforces the fact that there truly is no place for Eliza, or her generation, without capital and/or connections – in our modern world. Harveen Sandhu paints a compelling portrait of the modern under 25’s by transforming Eliza into a confused live wire. She frenetically tries to find her place in a world not prepared to accept someone with neither social ties nor the right family background–in spite of her enhanced education. Sandhu is perhaps the best ‘Eliza Doolittle’ I’ve seen, barring Dame Wendy Hiller, in the 1938 movie. Sandhu’s desperation is palpable, her desire to succeed commendable, and her declaration of independence at the end, entirely believable. Class consciousness was the focus of the documentary footage, interspersed with Shaw’s dialogue, on TV screens positioned at the top of the stage. An eye-opening segment featured an actual survey done on 161,000 British residents in 2011 to determine which of the new seven social divisions they fit into. Hinton’s depiction of Pygmalion takes the story much deeper. This production is not just about Eliza’s personal struggles to survive… it’s about a dying and declining way of life and a lost generation. Pygmalion is playing at the Festival Theatre until October 24th.